Applied Mathematics, Fourth Edition is a thoroughly updated and revised edition on the applications of modeling and analyzing natural, social, and technological processes. The book covers a wide range of key topics in mathematical methods and modeling and highlights the connections between mathematics and the applied and natural sciences. 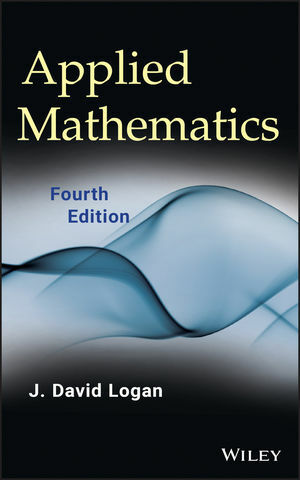 Written at an accessible level for readers in a wide range of scientific fields, Applied Mathematics, Fourth Edition is an ideal text for introducing modern and advanced techniques of applied mathematics to upper-undergraduate and graduate-level students in mathematics, science, and engineering. The book is also a valuable reference for engineers and scientists in government and industry. J. DAVID LOGAN, PhD, is Willa Cather Professor of Mathematics at the University of Nebraska, Lincoln. He is also the author of An Introduction to Nonlinear Partial Differential Equations, Second Edition and Mathematical Methods in Biology, both published by Wiley. Dr. Logan has served on the faculties at the University of Arizona, Kansas State University, and Rensselaer Polytechnic Institute, and he has been affiliated with Los Alamos Scientific Laboratory, Lawrence Livermore National Laboratory, and the Aerospace Research Laboratory.